Alzheimer's and dementia pose a lot of great challenges for families. In the beginning stages of the disease, some of the greatest challenges are the tough conversations that have to happen. It is time to stop driving; maybe we should talk to the doctor about not remembering; how are we going to pay for care; there might be a time you wander away from home and get lost. Not to mention family is tough. You know what I am talking about! These tough conversations are the inspiration behind a new workshop we created called, Conversations About Dementia. The workshop covers three of the toughest conversation you might have as a family, and how to navigate through, as well as options and resources to ease your decision making. We will be offering this workshop in Charleston on Wednesday at 5:30 p.m. and in Morgantown on Wednesday at 11 am. For more information call, 800.272.3900. Angel's Perch at the Clay Center for the Arts & Sciences on May 2! Get your tickets here! Click here for our community calendar of upcoming workshops and education opportunities. Caregiver University events are happening nearly weekly for the next 2 months! Click here to find a Caregiver University near you! Save the Date! May 29, Thanks for the Memories Luncheon will celebrate Senator Rockefeller's continued work as an Alzheimer's champion and advocate. For ticket and sponsorship information, click here. Are you ready for The Longest Day? The egg and egg associated dishes are synonymous with Easter. And, since my mom had all of Easter dinner covered (including my favorite - deviled eggs), I offered to make brunch. Well, except that I don't really know how to make any brunch type food. Fortunately, my only reading material at home is a plethora of food and lifestyle magazines full of Easter brunch recipes. 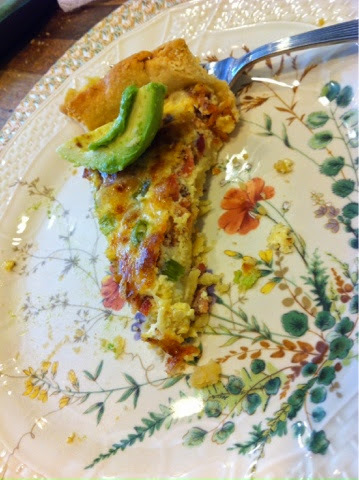 So, I landed on Quiche, until we were at the grocery store, and W says, "I hate quiche. I had it in France, and I hated it." Well, bad word. Well, I said back, too late now - this quiche train is leaving the station. There is really nothing heartier, and you can make it healthier - but why ruin a good thing? I tried to be a hero and make my own crust, my advice - don't be a hero. It was a lot of headache - so the below recipe is just for the filling - you are going to have to be responsible for finding your own crust! As it turns out W really liked my quiche - he had seconds! So maybe mine was better than France's? I like to think so. Preheat oven to 375. In a pre-baked pie or tart shell, layer bacon, green onions and cheese. In a separate bowl, whisk together eggs, milk, and seasoning. Bake for 30-35 minutes or until lightly golden. Serve with your favorite egg topping (avocado, hot sauce, salsa...) Then tell everyone it is better than France's.